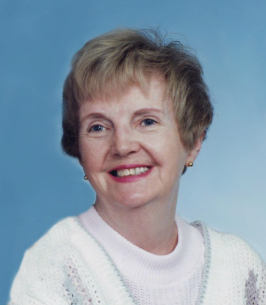 Mary E. (Barrett) McCluskey, of North Andover, formerly a longtime resident of Lowell, died peacefully on January 27, 2019, in North Andover, aged 85 years. She was the beloved wife of the late David Bernard McCluskey. Born in Lowell, April 26, 1933, to Julia (Lynch) and John Barrett, Mary attended Lowell High School, then went on to graduate from Catherine Laboreau School of Nursing. Shortly after moving across town to the Highlands, Mary met a handsome neighbor who was out working in his backyard. Getting a second chance at happiness, Mary was married to Dave, the love of her life, for 28 years until his passing in 2001. Together they enjoyed drives to Lake Winnipesaukee, Meredith, and Laconia NH, long rides on the pontoon boat, and camping in their RV from Nova Scotia to Florida. They also enjoyed celebrating their anniversary on trips to Foxwoods and Old Las Vegas with longtime friends and Highlands neighbors, Charlie and Ellie Wallace. 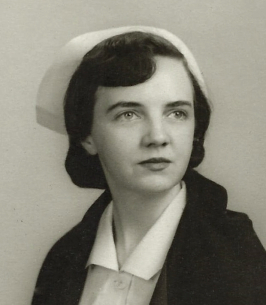 As a Registered Nurse, Mary pursued many different paths of nursing throughout her life. She was an OB nurse in the maternity ward at Saint John’s Hospital, where she had the great joy of delivering more babies than did doctors during that era. For a time, she was employed as a nurse for the City of Lowell in the Health Department, and at the Lowell Vocational Technical School. She was also the school nurse at several public elementary schools where she loved the kids and enjoyed listening to their many stories and tall tales. Oftentimes, after a long school day, she would come home to unwind and watch As the World Turns with a cup of tea and a Suzie-Q or Devil Dog. Over the years, she formed lifelong bonds with a tight group of nursing friends who were more like extended family, including Chris, Nancy, Rosemary, Peggy, Estelle, Pauline, Cora, Ellie and many more. As any nurse will understand, Mary was always available as the eternal nurse advisor to her family and friends, especially during the holiday season. A huge fan of the Bingo scene, she loved the game almost as much as the wonderful friends she made along the way. She often played two or three times a week at Sacred Heart Parish, the Assumption, the Holy Trinity, and the VFW, making sure to support each organization equally. She shared a 60 year friendship with Joan Hart, her BFF, who enriched her life and made her laugh at every turn, whether during a late night Glenview or Good Thymes dinner, or on a drive to the beach. Mary was a devout Catholic, a firm single mother, a cancer survivor, a go-getter and a lover of people, but it was her grandchildren, Garrett and Molly, who ignited a love that expanded her world and renewed her energy. Mary often joined them at the Wenham Train Museum, and attended their soccer games, cheering tournaments, band concerts and dance recitals. Much to their delight, she taught them the Hustle and the Chicken dance. They were the light of her life, and brought her immeasurable joy. For the last four years, Mary resided at Brightview North Andover on the Wellspring floor, where she formed a tight bond with aides Jasmin and Joan, who took care of her as though she was their mom. From time to time, members of the dinning staff, especially Robert, Eddie, and Tom, stole the show and all of her attention. The family also wishes to thank the staff of Care Dimensions/Hospice of the North Shore for their compassionate care over the last year, as they made daily living as comfortable as possible for Mary. Social worker Ally, and nurses Paul and Sarah, helped to make the very end bearable. She is survived by a daughter, Pattiann Bampos, and two grandchildren, Garrett Bampos and Molly Bampos, all of Middleton. A sister-in-law, Evelyn Barrett of Southbury, CT, four nieces, Kathy Hagstrom and her husband Jeff of Oxford, CT, Colleen Holland and her husband Michael of Roslindale, Sheila Donnelly and her husband Steven of Marshfield, and Sharon Pavlinsky and her husband Gerry of Brookfield, CT; brothers-in-law, Jimmy McCluskey of Dracut, and Tommy McCluskey of Lowell; Tom’s children, Kathy Roche and her husband Brian of Windham, NH, and Dee Goad and her husband Danny of Townsend. Dear friends, Joan Hart and her children Colleen and John Chapman, Joe Hart, Dan and Maria Hart, and Kate and Armand Toutaint; Judy, Joanne and Kevin Kirane, Kathy (Wallace) and Paul Cummings, and the entire Castle family. MCCLUSKEY - Family and friends will be received at the MORSE-BAYLISS FUNERAL HOME, 122 Princeton Boulevard, the Highlands neighborhood of Lowell, on Saturday from 9:30 to 10:45 AM, followed by her Funeral Service at the funeral home at 11:00 AM. Interment in St. Patrick Cemetery, Lowell. Friends who wish may make memorial donations in Mary’s name to: Care Dimensions, 75 Sylvan Street, Suite B-102, Danvers, MA 01923. Funeral Director, Frederick W. Healy.